The banks of the River Gambia have been inhabited for many centuries, but the archaeological evidence is as yet insufficient to throw much light on early Gambian history. The first known record of The Gambia is a brief reference in the account by Hanno the Carthaginian of his voyage through West Africa around 470BC. During the 5th and 8th centuries AD most of the Sene-Gambian area was part of the Empire of Ghana, whose rulers were of the Serahuli tribe. In the centuries to follow, tribes of Mandingoes and Susus from the Fouta Djalon Plateau of Guinea established themselves in what is now known as Mali. Charles II, King of England founded the Royal Adventurers Trading to Africa whose main objective was to purchase slaves for the West Indian and American plantations. 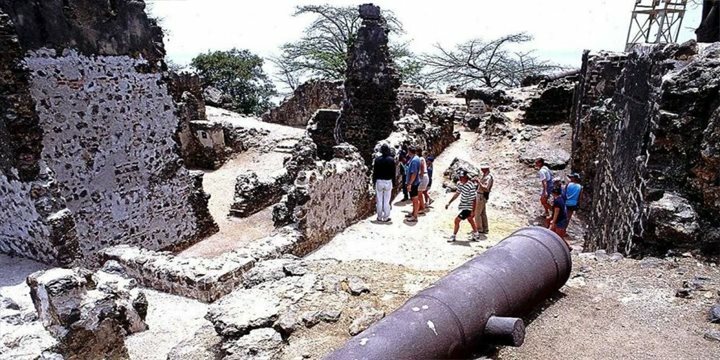 In 1661 the company captured St. Andrew's Island in the River Gambia, renaming it James Island, built a fort on it and founded the first English settlement on the West African Coast. During the 18th and 19th centuries there was bitter and protracted religious dissension, cutting across tribal loyalties. One consequence of the strife was that various chiefs sought treaty protection from the British established at Banjul, so British administration gradually spread over the whole country, the last such treaty being concluded in 1901 with Musa Molloh, Chief of Fulladu. American author, Alex Haley, highlighted the slave trade from this area in his best selling book "Roots", also adapted for a TV mini series, as he traced his roots back to the banks of the River Gambia. Today, tourists can travel upriver on an excursion to some of the landmarks, including the village where Hayley's great, great grandfather, Kunte Kinte, is said to have been born. Find out more about the 'Roots' Excursion here. The oldest English-speaking country in West Africa, The Gambia gained independence from Britain in 1965, led by Sir Dawda Kairaba Jawara, first President of the Republic of The Gambia. In 1977 he opened the 250 acre Abuko Nature Reserve, affirming with The Banjul Declaration his intention to protect and preserve the flora and fauna of The Gambia for future generations. In 1990 the country celebrated its 25th anniversary of peace and stability. A bloodless coup took place in July 1994, and an interim government was installed. The following election was won by Yahya Jammeh who remained in power for 22 years. In December 2016 the election was won by Adama Barrow who was sworn in as president the following February. In 2018 The Gambia rejoined the Commonwealth having received unanimous support from the member states. Roots - Alex Haley's famous novel which explores the history of one of his ancestors, Kunta Kinte, and how slavery brought him from The Gambia to America. Buy Roots on amazon.co.uk and the DVD box set. Water Music - TC Boyle's rather frantic recreation of the explorer Mungo Park's explorations of West Africa is more than worth reading. It gives a real flavour of how this part of Africa might have been in the late 18th century. Buy Water Music on amazon.co.uk. You can also read Mungo Park's accounts of his journeys in his Travels in the Interior of Africa. Buy Travels in the Interior of Africa on amazon.co.uk. The entry for Mungo Park at Wikipedia.